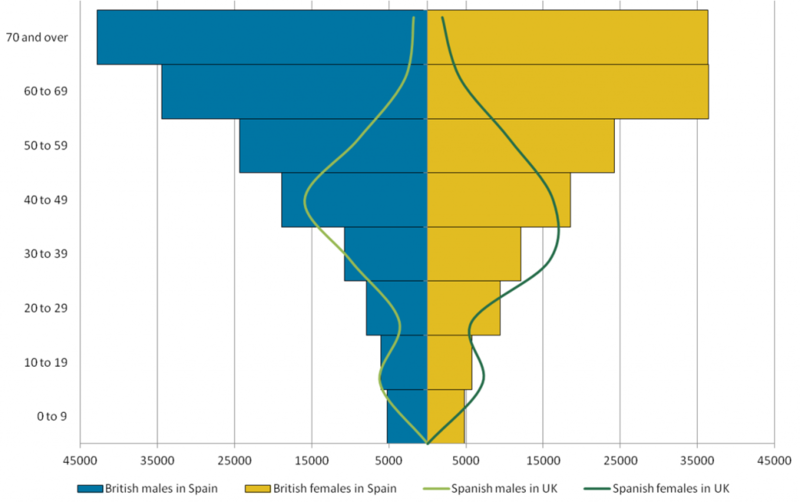 A new study from the UK Office of National Statistics (ONS) sheds light on the British expatriate population in Spain, and also looks at the Spanish expatriate community in the UK. The report, released at the end of June, reveals there were 296,600 British citizens resident in Spain during 2016, and 121,000 of them (40%) were aged 65 and over. The number of British expats in this age bracket has more than doubled since 2006. The figures come from the Spanish National Institute of Statistics (INE), and cross referencing them with data from the UK Department for Work and Pensions (DWP) broadly bears them out. DWP figures show that 108,433 recipients of the UK State Pension were resident in Spain in November 2016, which is close enough to the 121,000 expat population aged 65 and over to suggest both figures quantify the same group with some accuracy. This surprised me. I would have expected the INE figures to be fairly inaccurate and underestimate the number of Brits living in Spain, because many of them choose to stay off the radar for fiscal and bureaucratic reasons. Perhaps they are more reliable than I thought. Taking the INE figures at face value, we see that the British expatriate community in Spain has declined 4% since the last census in 2011, when there were 308,805 Britons resident in Spain. Since 2002 the number of retired British citizens aged 65 and over has been steadily growing, whilst all other age groups have been declining since around 2008, when the economic crisis began (see following chart). 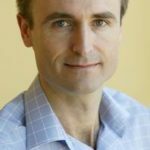 Of course another reason why the 65 and over group has been growing is because we all have this annoying tendency to get older. 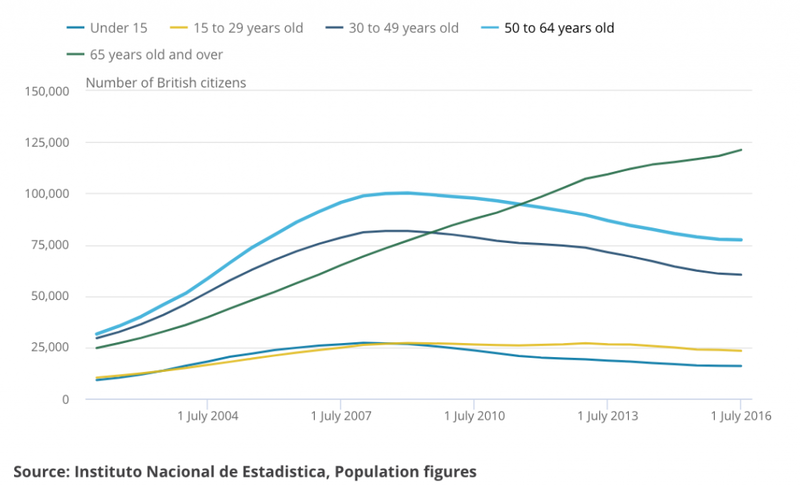 Is the 65 and over bracket also growing because more British citizens are retiring to Spain? That’s a possibility, although I can’t find any data on that. But what is clear is that in all other age groups the net change is negative, meaning that more people in those age groups are leaving or getting older than are being replaced by new arrivals. In contrast, there were 132,000 Spanish citizens living in the UK in 2015, with a much younger age profile that British citizens living in Spain. 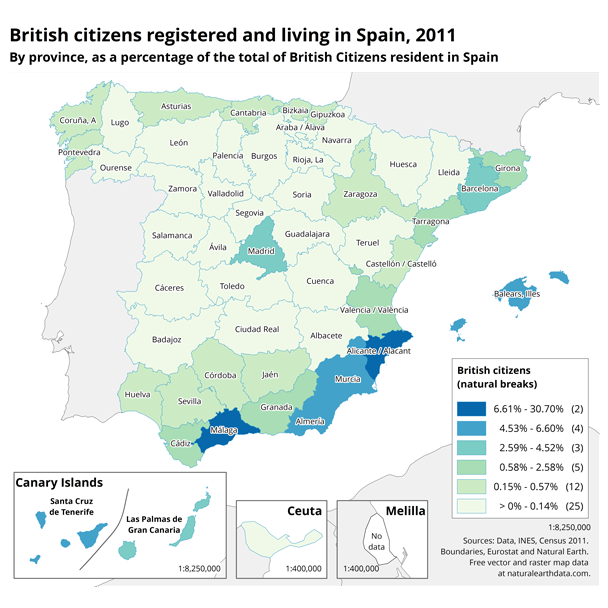 The report also maps the British expat community in Spain by region, though the figures are from 2011. Unsurprisingly, the biggest numbers are in Malaga and Alicante provinces, home to the Costa del Sol and Costa Blanca respectively. Other concentrations are found in the Balearic and Canary Islands, Murcia, Almeria, Barcelona and Madrid. The rest are very thinly spread around a few other provinces of Andalucia, the Valencian Region, Catalonian, the the north of Spain. The report, which the ONS explains “is the first in a series being published to provide more information on British citizens living in the European Union (EU) and EU citizens living in the UK,” and has “been created in response to an increased user need for data about the people who may be most likely to be affected by the UK’s decision to leave the EU,” can be read in full here: Living abroad: migration between Britain and Spain. totally inaccurate figures. we know many people living in Spain permanently and cheat the system by not registering and not paying tax. also they cheat using their ehic cards giving a UK address and cheating só they get the winter fuel allowance. the Spanish government know that there are probably over one million British living here. perhaps brexit might scare them however these people think the Spanish still ride around on donkeys ! oh no they don’t, they will be caught especially when passports will be stamped. As a Brit who pays both Spanish tax and uk tax was angry with the previous comments. I agree there are many non Spanish expatriates in Spain who ‘buck’ the system. Don’t forget the revenue which is brought into Spain both by the Owners of properties and tourism. Many law abiding britis are feeling demoralized by the comments of a few. IF and when Britain leave the union, this bucking the system will still be under the radar as they will not have their passports stamped as they remain in Spain. I’ve checked the report. The stats are from 2011, 6 years ago and the information they were calculated from was probably out of date then. Not worth the bother of reading and analysing for that and the reasons above, given by others. Most of the figures are based on the 2016 census. Personally, I found some of the numbers quite interesting, especially the change in expat population by age groups. I see business implications in that.